Kid builders make this programmable drone look just how they want and move how they want, too. The modular design consists of a central hub and six foam-covered magnetic propeller modules that can be endlessly reconfigured—even as a hovercraft. The Makeblock app gives kids a simplified introduction to coding and turns a smartphone or tablet into the remote control for the drone. And it’s where they can drag and drop commands to make their DIY drone fly and hover. 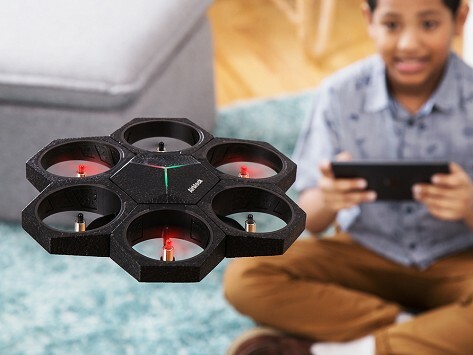 Airblock is a programmable drone for kids and it’s also a dream come true for Makeblock Maker Jasen Wang. (Lots of hard work went into it, too.) A lifelong love of robotics inspired him to create a learn-as-you-go drone that kids can configure and reconfigure how they like and that they can fly free form or program to do aerial tricks through its app. Six magnetic propeller modules connect to the central flying hub. They are easy to move to suit what a little engineer has in mind for their flying machine. And this drone can hover, too. The Makeblock app turns a smartphone or tablet into a remote control and its coding-made-easy approach was made with kids in mind. By dragging and dropping blocks of commands, like forward, turn, and pause, they tell their DIY drone exactly what to do.